Forefront: Purple Haze, an oil by Kaitlyn McLeod of F.E. Madill. If You Prick Us Do We Bleed, sculpture by Carley Burke, F.E. Madill. brow and chiselled chin. But walk around to the right side, and a shocking transformation takes place. 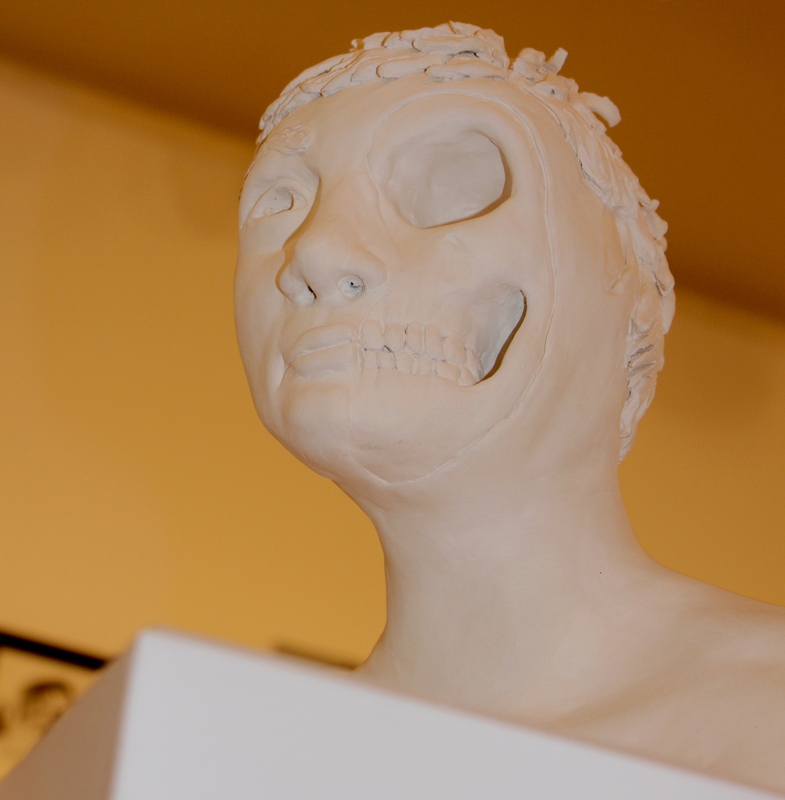 That side is stripped of flesh, with a gaping eye socket, jawbone and teeth exposed by the artist, Carley Burke, of F.E. Madill Secondary School in Wingham. 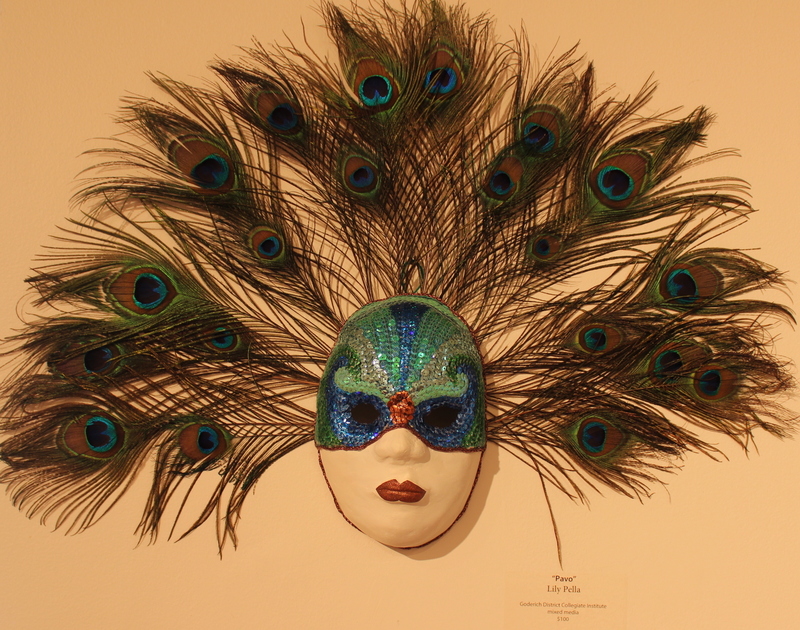 Hers is one of a handful of sculptures and three-dimensional art on display alongside dozens of pieces of art by students from Grades 9 to 12 in high schools across Huron and Perth Counties that’s on display in the Student Show 2015 at the Blyth Festival Art Gallery. The art is as varied as teens are apt to be, with only the fact that the artists are students to tie together the show. 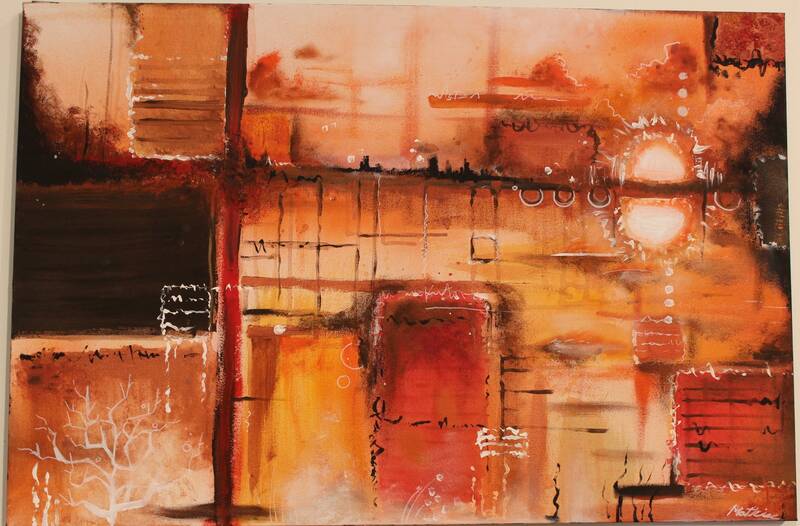 Crimson Sunset, an acrylic by Mathias Ball of Goderich District Collegiate Institute. expect, much of the subject matter is drawn from the media and popular culture – those things that capture the attention of teens, like Spiderman, The Joker, Alice in Wonderland, Robin Williams, Darth Vader and the Beatles. All burst with energy, with vibrant colours and bold strokes. 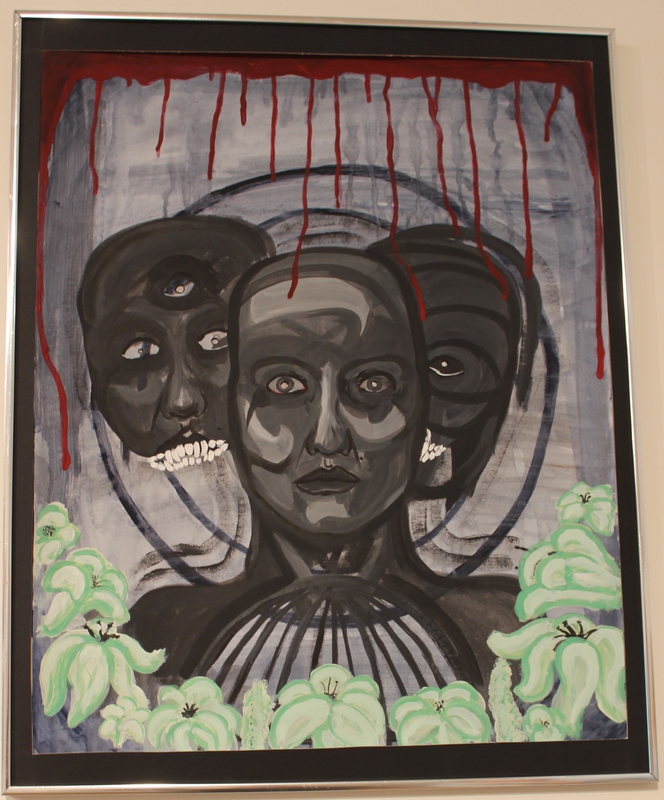 Self-portrait, an acrylic by Emma Johns of Central Huron Secondary School. 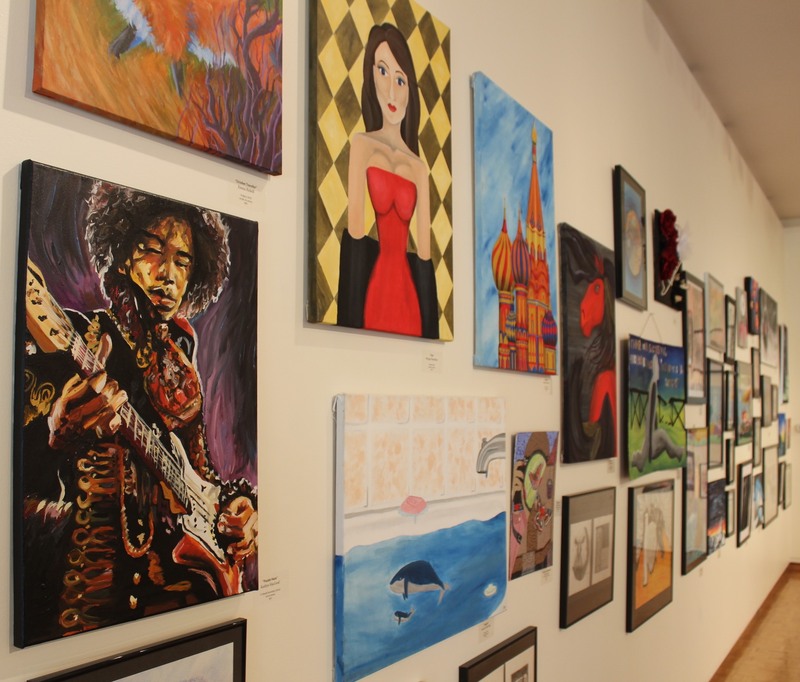 A visit to the gallery, which could take up to 45 minutes to contemplate, coupled with lunch or tea at a nearby restaurant makes for a nice afternoon getaway in Huron County. The free show will be available for viewing during the Blyth Festival box office hours and continues on display until May 21. Then from May 23 to June 19, works from artists from the region will be on display in a non-juried Community Show. Opening reception is on May 23, starting at 6 p.m. When, Until May 21, Monday to Saturday, 9 a.m. to 5 p.m.
Pavo, a mixed media work by Lily Pella of Goderich District Collegiate Institute.